One of Britain's most abundant small mammals, the Common Shrew has an insatiable appetite for insects and worms. It is 55-82 millimetres (2.2-3.2 in) long and weighs 5-12 grams (0.2-0.4 oz), it has dark brown fur on the back, chestnut-coloured sides, with a pale underside. They need large amounts of food to survive, eating the equivalent of its own body weight every 24 hours. They also need to eat frequently, as they can starve to death in less than a day. So they are active day and night, constantly foraging, resting for only a couple of hours at a time and unable to hibernate in the winter months because being so small their bodies cannot hold sufficient fat reserves. Common Shrews can be found in most habitats, but prefer woodland and grassland. They live for only one or two years but have three of four litters of around six young during this time. When disturbed from the nest, young shrews sometimes follow their mother in a chain using their flexible snouts to hold on to the tail of the sibling in front. Shrews can be distinguished from mice and voles by their tiny eyes, very small ears and pointed faces. 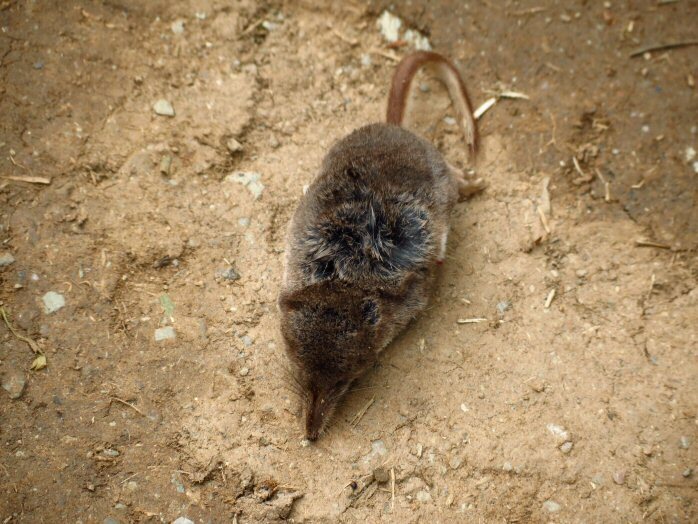 Common Shrews are larger than Pygmy Shrews but their tails are only half the length of their body (Pygmy Shrew tails are two-thirds the length of their bodies).